I have to commit: it is 2:50 am in the morning, I worked on all this for round about.... 5 hours or so but....well, I finished my exams and now I realized I got so much spare time that I started this mess. And I got addicted to all this armor history thing. This is the updated, final Version from the third page!!! Do you have something to add ? I know IÂ´m not a graphic artist, but for a general overview this could be a starting point. Am I totally wrong in some points? There was huge difference between Gino and TE about some points, but I figured something out that made sense in my mind (the best, that my mind was capable of after those 1k pages ). So this is not hammered in stone. 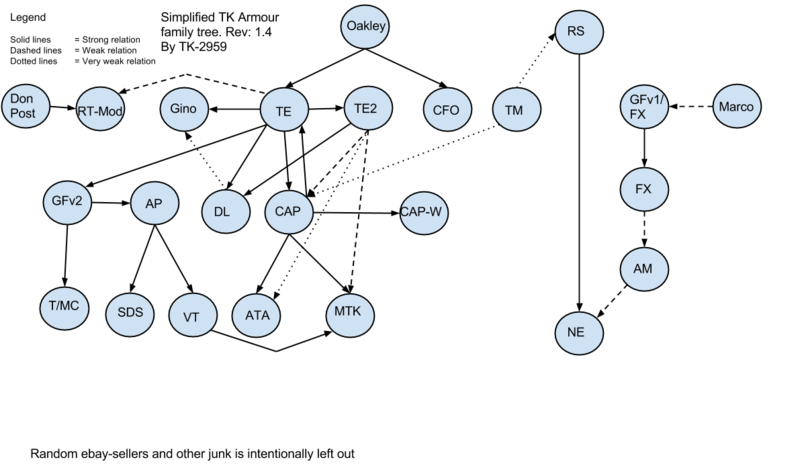 I just have not found T/MCÂ´s place in this chart, Tray said (here: http://www.whitearmor.net/forum/topic/11945-what-is-the-tmc-tk-kit/?hl=tmc#entry147296) that the origin is a suit previous to the AP, so is it GF 2? Cheers troops, I hope that I can make it easier for some newbies to get into this lineage topic. That's funny, I've been working on the same thing. Although mine is intentionally made simple. It's still a work in progress and there has been some feedback from other staff members that will eventually work its way into the chart. Btw, if I remember correctly, it was the ears that Gino got from DL. Essentially creating a mix of Brian R helmet with Dave M ears. It should be noted however that my chart doesn't cover linage specifically but more how the different makers relate to each other. Not "this suit is cast from that" although in some cases that might be true. It's just not the purpose of my chart. Mathias, is DL for Dan Laws? Ahd what is the relation with T/MC and GF? Nice work both of you. These charts are fascinating. I like the breakout showing GF1 and GF2... that sounds like a better description! now all we'd really need is to have the producers themselves show their comments on the data to get a clearer picture. Very cool work, both of you! This is definitely one of those things that is awesome to have access to, just for general background knowledge and history. Truly cool to get this type of understanding clearly (mostly) spelled out! Truly amazing, that you Guys could find heads and tails in all of it! - There was only one set of original ROTJ molds (molds taken from the inside of the original parts) and I still have them. There were not multiple sets of original molds. Anything that came out of TE in terms of molds (other than the original ones I have) were reworked copies and not originals. - Dan Laws did not use the original molds but rather used old vac formed pulls from them, then combined them with some tour suit parts and reworked old GF parts to create what would go on to become TE2. - Nothing was molded off the Dave M helmet other than the ears. I got a duplicate set of these molds to combine with my Brian R molds. - I kept the only intact (mostly) unaltered version of the Brian R helmet molds (which were mold duplicates). The originals that were sent back to TE were altered to remove certain details and severely damaged from so much use. These altered/damaged helmet molds were later sold to TE2. the first of the original makers on the list to chime in on the actual situation, giving us all clarity of vision and explanation of the facts. I'm sure we all knew in the core of the hobby that MG was making copies of the forming tools in order to make money. after all if you have an interesting looking product... why not profit from it... must have been MG's motives. I think I'm going to FWD this to abs80 and have AP add his history lesson to the mix! comparing it to an original suit casting. sure would be cool to have dates in a vertical. This information is really very interesting! The charts (accurate or not) really help paint a picture of our white plastic history. Thanks for putting that together. I don't have much of an opinion to share on the recasting comments, but it's still an amusing fact to remember that the ROTJ screen-used suits were recast from the left-over, beat-up suits from ANH. This was before any fan (that I know of) had opportunity to do so, and there is huge differences between the two suits. IÂ´m pretty happy that you like the result! And also I am very happy that you Gino entered this thread that fast - impressiv, most impressiv. Thanks for your feedback, I worked the chart over. What was used for the GF2 and TE2 I called "mold copies". I donÂ´t know what was used exactly, probably only MG/TE knows, so I keep this section indistinct with this description. TE proved himself as a pretty tricky businessman, why would he have brought himself into the position of not posessing molds, so that he was in need of GF parts to use for the TE2? I mean: this guy had molds lying around his workshop for some time, so why would he not copy them to keep a backup? ThatÂ´s just silly and rational people, who want to make money, would not think that way. ThatÂ´s why I keep the GF parts for TE2 out of this chart for the moment. Vern: Thanks for the feedback too, corrected the GF1/FX to "fan sculpt". Mathias: How did CAP influence TE, I mean why is the arrow also directed from CAP to TE? I like your chart, itÂ´s great for a quick overview of the topic and you donÂ´t step to deep into "who-cast-who" discussion. ThatÂ´s a risk my chart has. I left CFO out for the moment. Is it also from the Cameron Oakley suit? How did Joe and Mark get ahold of it? And is T/MC really cast of the GF2? P.s. : And thank you for moving the recast discussion. DidnÂ´t meant to start a new fight over this case. I think it would be cool to add brian muir and liz moore... and then some factor on elstree model makers? this would help to complete the top of the tree? best sources for that would be the original makers themselves! I'm sure brian M would love to see this! process and the restart with the GF/AP re-integration. then all we need to do are add photos to the chart.. I would love to have this as a large poster. with the photo tree and the flowchart tree! I'm ready to buy that right now! that is why they list it as GF/FX? Paul I ask this with the utmost respect and am in no way trying to flame or cause bad feeling. Have you got 100% conclusive evidence of what you are stating with regard to your comments about the origins of Paul's helmet and armour? I have heard smatterings of this in the past and personally do not believe it to be true. I would ask that you either put forward your evidence or remove the comments. Accusing someone of recasting is a very serious matter and although Paul is not a 501st member per se you are and this is not in keeping with what is in the charter. Paul has had the hots for me for a while and continues to accuse me of recasting. I have been on this journey for 15 years now and there is no photographical evidence of me sculpting anything as all photos I did take were lost in my Yahoo account when they shut down. Not that they can prove I actually sculpted them anyway, and the sculpts looked nothing like they do today, so they didn't prove anything. Back then, I had no digital camera to take photos or even had much internet access, and never even heard of the word recasting, although I was quickly accused of it from TE when I shown my ROTJ armour on the RPB all those years ago. The fact is I cannot prove I haven't recast anything so I am not sure what I can do to rebut the claims. Oh, and nice to see you sniping again, Geordie. Paul has had the hots for me for a while. Not true. I recommend your armor to many people, including those in my garrison, even today, and on these boards. thats the thing about armor origins threads... we always have this kind of debate. it goes with the territory, not that it matters much... for a fact the process of sculpting itself goes though different iterations. after talking at length with TM today he mentions that he used as many armor parts he could find as visual guides to make his sculpts... while not recasting them, he did take measurements, and base his designs upon those sources. in fact he also mentioned that he's remaking all of his armor sculpts as a result of being in the shop over at RS and has taken ton's of photos and measurements to re-create his sculptures and adding back in the waves... and the chips and the warped nature of the parts. he likes he bumpy format and wants to create the worn look that ANH armor has. the fact is... when you use TE as a base... you have to undo the fixes that MG did... and you have to use photos of original armor to acomplish that... so now with RS as a basis TM is planning to get ever better... all while avoiding the recast process. I've been wanting to see a tree like this a long time... and it's like a pile of firewood for some.. and a source of fruit for others.